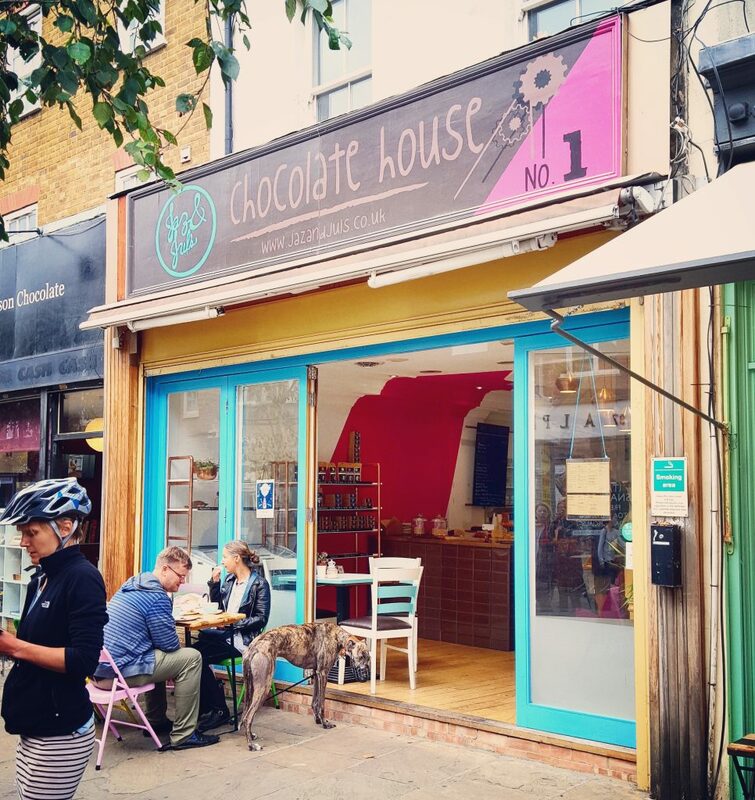 Jaz & Jul’s in Islington have recently launched a new chocolate-themed weekend brunch at their Chocolate House on Chapel Market, just a few minutes walk from Angel tube station. 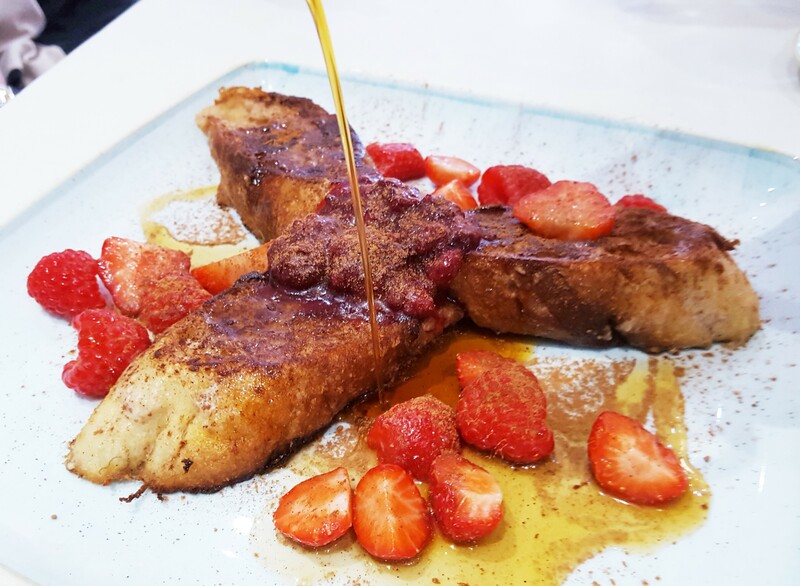 I LOVE a good brunch, so my friend Kirsty and I popped in to try it out a couple of weekends ago. 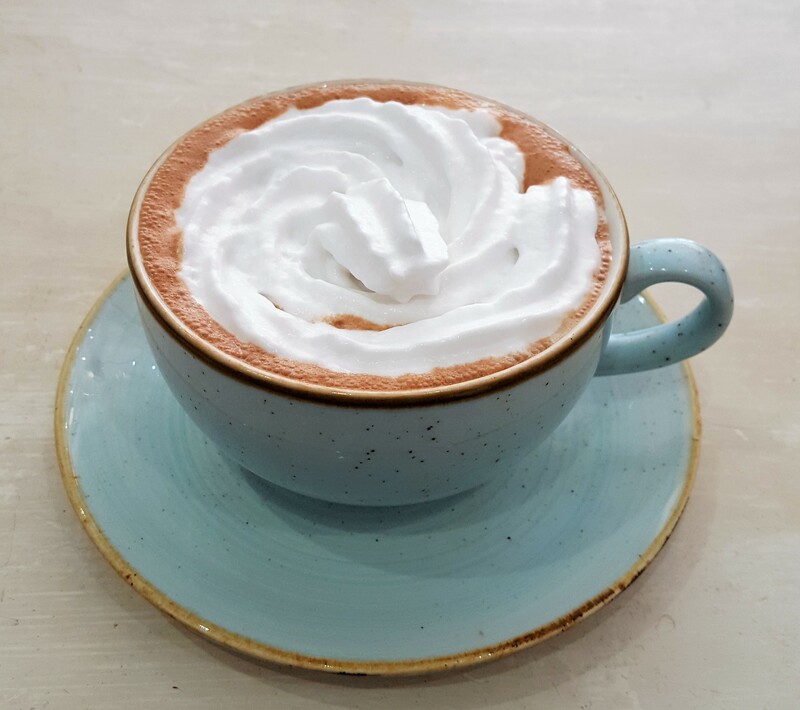 Jasmine Kershaw and Juliet Sampson are serving up their new brunch from 10am to 3pm every weekend at their cafe and shop, which is also the production workshop for their acclaimed hot chocolates. After taking in their incredible hot chocolate menu, they suggested I try their 70% handmade single-origin drinking chocolate with whipped coconut cream. This was really intense but in the best possible way. I love a good hot chocolate, I can’t be bothered with a weak, insipid one and this one really did hit the spot. The weekend brunch specials consist of french toast and waffles. We decided to start with savoury. 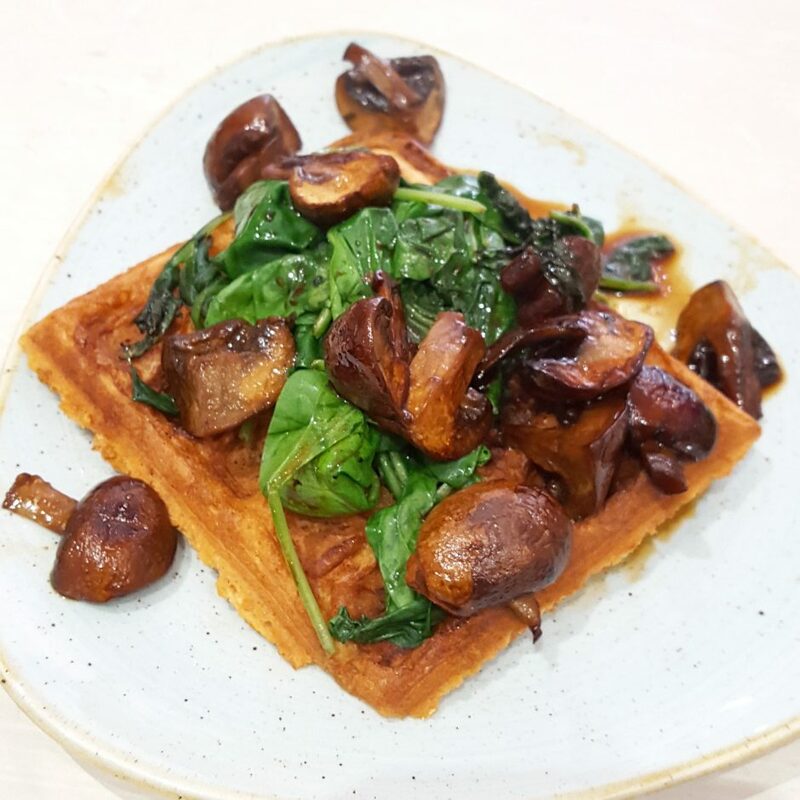 The two options are Fried egg with buttered spinach and hollandaise or Beer-marinated mushrooms & spinach on your choice of plain or cornbread waffles, both for £7. Extras are spinach, marinated mushrooms, roast cherry tomatoes, fried egg, avocado, grated cheddar and crumbled feta for an additional £2 each. So we ordered the beer-marinated mushrooms & spinach on cornbread waffles and avocado, feta and roasted tomatoes on plain waffles. (The photos show just one waffle of each but you get 2 waffles for £7). These were a delight! I adore mushrooms anyway but I’ve never had them soaked in beer…my God, I’ll be trying myself in the futre, they were divine! And the cornbread waffles kept their crispiness despite having the spinach and mushrooms sitting on them. The fluffy plain waffles with the avo, feta and tomatoes were lovely too. 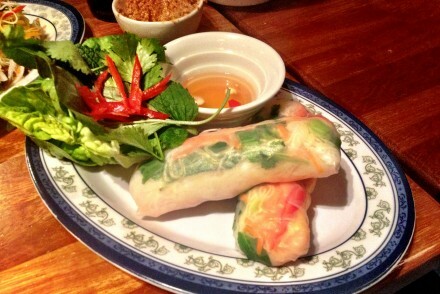 Light and fresh and the perfect cure for our combined hangovers. I don’t know why I don’t eat waffles more often. Whilst my friend and I were wolfing our dishes down, we both commented that it might be time to invest in a waffle iron. 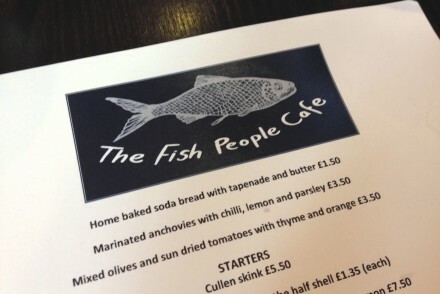 Yet again, another occasion where I was gutted I was having to share a dish with a friend! I could have devoured this on my own in seconds. It was a truly indulgent dish but exactly what I needed at the time. The bread still held its own, giving the dish some bite and chew. (So often French toast can almost disintegrate in the mouth.) The hint of the coconut and banana came through from the batter and the generous sprinkling of cinnamon and cocoa kicked this dish into high gear, with the strawberries cutting through the sweetness and giving it some needed freshness. I loved it. My friend and I were feeling rather worse for wear on the Sunday we visited Jaz & Jul’s so we really weren’t in the mood to start drinking again. 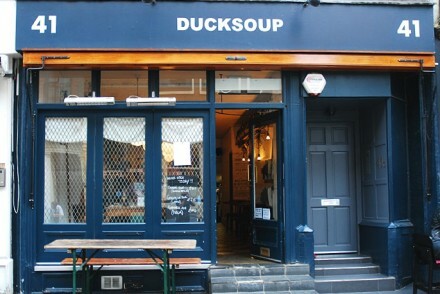 However, they do have a lineup of special boozy brunch cocktails including Mimosas and Spiked Iced Tea, plus a shot of organic liqueur can also be added to any of their hot chocolates (as well as artisan marshmallows and whipped coconut cream). If you have more of a sweet tooth than I do, Jaz & Jul’s also have chocolate-stout waffles with toppings ranging from peach and nectarine slices plus Kentish cobnut ice-cream (handmade by fellow Broadway Market trader Nonna’s) to banana, chocolate sauce and crushed peanuts. During the week, you can take your pick from healthy choices such as granola-topped smoothie bowls combining cocoa, avocado, banana, date and almond, or toast with ‘Jaffa cake’ orange marmalade and chocolate chunks, Seggiano chocolate-hazelnut spread or cocoa nib and olive tapenade.